We’re going with the big guns for this week’s Classic Rock Sunday. Van Halen dominated the hard rock scene in the late 1970’s and early 1980’s. Their rise coincided with the birth of MTV and the antics of front man David Lee Roth were perfectly suited for the new music video format. Van Halen was formed in Pasadena in 1974 when the brothers Van Halen hired David Lee Roth to be the lead singer of their band Mammoth. Roth suggested they change the name to Van Halen and the band set out to conquer the local music scene. Their gigs in local parks and clubs were incredibly popular, eventually garnering the attention of Gene Simmons of KISS. Gene produced a Van Halen demo tape and suggested they change their name to Daddy Longlegs. Fortunately the lads refused and Simmons took the demo tape to his KISS management. After being told the band would never make it Gene lost interest and went back to his KISS empire and bedding thousands of groupies. 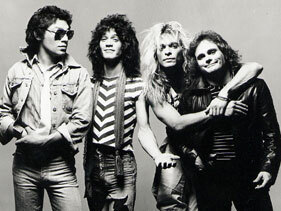 Van Halen were eventually noticed and signed by Warner Brothers and recorded their eponymous debut album. Van Halen is simply one of the greatest debut albums in rock history. It seemingly dropped out of the sky, fully formed by the gods of rock. It sounded like nothing anyone had ever heard before but at the same time was instantly accessible, with huge poppy hooks, Diamond Dave’s yelps and screechs and Eddies insane solos. The first song is Runnin’ With the Devil. Keep in mind this is the first song on the first album by a totally unknown band. It out-swaggers anything by KISS, out-menaces anything by Black Sabbath and out-boogies anything by Aerosmith. Runnin’ With the Devil is followed by Eddie’s mind-melting solo, Eruption. To say it was revolutionary is an understatement; no one had heard sounds like this before on a rock record. A track consisting solely of an extended guitar solo might seem pretentious but here it serves notice that Van Halen is about Eddie’s playing as much as it is about Roth’s showmanship. Even without seeing Eddie’s impish grin we can hear it coming through in this solo. He knows he’s a virtuoso but he’s still having fun with it. There’s a reason Marty McFly used a Van Halen solo to fry George McFly’s brain: even 33 years later it still sounds like it came from another planet. Interestingly, even though he was the more pop oriented member of the band David Lee Roth was dead set against Eddie playing the synth. It echoed similar sentiments expressed by Roger Daltrey 15 years earlier when Pete Townshend was farting around with primitive synthesizers. They both felt that they had one of the best guitar players on the planet so why start playing with synthesizers. In both cases they were wrong, the synths opened up a whole new sound and enabled the bands to crossover to a more mainstream audience. Jump was the first of four huge hits on 1984, along with Panama, Hot For Teacher and the synth driven I’ll Wait. Panama is pure dark sexual sleaze and I’ll Wait is another pioneering synth driven rocker but it was Hot For Teacher that grabbed all the headlines for it’s controversial video. No one could ever accuse Van Halen of being subtle and they prove it here, with a video featuring strippers dancing in front of a bunch of middle school kids. Even today Ms. Phys Ed makes quite an impression. I remember when this was shown on MTV they put black bars over the crotch grabbing when the boys did their little dance. Half naked women were ok but hands over crotches were definitely too racy for tv. And here’s a bit of trivia for you: the voice of Waldo is provided by a pre-SNL Phil Hartman. Van Halen continued to crank out some good hard rock but the loss of David Lee Roth’s sense of humor doomed the band as they became more serious over the years. The band’s subsequent lead singer soap opera made it clear that the problem was never David lee Roth’s ego, it was Eddie’s insecurity and need for control that made it impossible for him to hold a band together. The heavy drinking and cocaine use didn’t help things either. There are once again rumors that Dave might join the band for another tour but nothing has been announced.